WISHIHADTHAT, INC. staff are available Monday through Friday, 10AM-6:30PM EST (7AM-3:30PM PST). Orders may be processed online using our online secure cart checkout process or you can call in for assistance from a friendly staff member. Just call 1-800-419-1130. We are a full service online retailer and want you to be happy with your purchase. Feel free to contact our knowledgeable Customer Service team if you have any questions about products or your order. Some products on WishiHadThat.com, such as the Marble Statues, are one-of-a-kind unique items. If you would like detailed photos of a particular item, please do not hesitate to ask us. We can also be contacted by email. Send questions or comments to sales@wishihadthat.com. If you're shy on the phone, you may contact us by eMail. Send questions and comments to sales@wishihadthat.com. WISHIHADTHAT, INC. reserves the right to revoke any stated prices/availability and fix errors in pricing/availability. If an item is priced incorrectly, WISHIHADTHAT, INC. reserves the right to correct the price. If the wrong stock count is published on Wishihadthat.com, WISHIHADTHAT, INC. reserves the right to correct the stock count at any time. If an incorrectly priced item is purchased and a customer's credit card or bank card is charged, a refund may be issued to that card. We may attempt to contact the customer to resolve the issue. After you've loaded your cart and filled out the information requested in Step 1 of the checkout process, select Check as your payment option and proceed. Print the confirmation invoice and mail it with your Check. You will receive a confirmation email from us after your checkout experience. For assistance, please call 1-800-419-1130 or email sales@wishihadthat.com. In accordance with state laws, uDecor.com will be applying applicable sales or use tax to all transactions according to the buyers state tax or use laws. Shipping is calculated as 10% of the subtotal of your order, with a minimum of $11.99. We are currently running a special promotion that provides free shipping on most orders over $99 within the contiguous US. Orders below the minimum quantity can be placed over the phone and a surcharge will apply. Call us at 800-419-1130 for assistance. Orders shipped outside of the contiguous USA (Alaska, Hawaii, US territories and Canada) require shipping and handling costs, thus the order will be subject to these additional fees. Call us at 800-419-1130 for assistance when an order requires shipping outside of the contiguous US. Often times an order may be too large or heavy to be shipped with a ground carrier. In these cases, an order will ship using an LTL (Less than Truckload Load) common carrier also known as freight. Asking the driver to unwrap, uncrate, or unstack a freight delivery which is considered Inside Setup. This also includes taking the packaging materials back with them even if they didn't unpackage the freight. Our checkout procedure will automatically reject any orders for shipment outside of the United States and Canada, so there are special procedures you must follow. 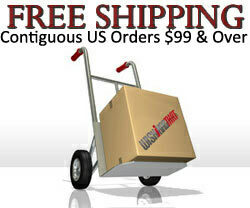 WISHIHADTHAT, INC. is happy to provide Same Day Shipping (SDS) on qualified in-stock products. With SDS, orders placed before 12:00PM EST (9:00AM PST) will be packed and shipped on the same day as the order! Now, customers can have orders filled faster than ever before. Look for the Same Day Shipping logo on qualified items. If a qualified order is placed by 12:00PM EST (9:00AM PST), Monday - Friday, we will send it out that same day. If an order is placed over a weekend or holiday we will give your qualified order priority, when we return to work the next eligible business day. If a qualified SDS item is purchased with a non-qualified item, we will do our best to honor our same day commitment. But, we do not guarantee same day processing. Sometimes, an order may require that we contact a customer to clarify the order. In that case, if we are unable to reach the customer, there could be a delay in preparing an SDS qualified order. We will always strive to process an order by the same day; but, we cannot guarantee same day service if we are unable to contact the customer by the cut-off period. We are excited that you have ordered from us and we want you to be completely satisfied with your Wish I Had That.com purchase. We strive to protect our items from the normal rigors of shipping, but occasionally during transit, there are problems that occur which are beyond our control. Below is a guide for any necessary information that you may need when receiving your order. Our shipping process is divided into two categories. We use ground shipping for most of our items. Larger items are packaged in crates, which are specifically built for that particular order and are shipped freight or what we call LTL (Less than Truck Load). Drivers are responsible for delivering your product to you. For Ground carriers this is to your door. Freight delivery is to the most accessible location that the back of the truck can reach (typically at the street at the base of the driveway). They cannot move the product indoors and will not un-crate the products or remove the crating materials. You should be prepared to move your delivery and have a cordless screw driver with a #2 Phillips head and a claw hammer at the ready. You may have arranged for special delivery and some or none of the above may or may not apply to you. If you would like to arrange in-side delivery call us 800-419-1130 before your order ships out. This service is not available for all products and is an extra cost that you will be responsible for. Notify us within 3 days at 800-419-1130 or you can e-mail us at sales@wishihadthat.com. Take digital photos of the damage and email them to sales@wishihadthat.com. Include your order number and a description of the problem areas. Photos are a great way for us to be able to see what kind of damage was suffered and allows us to file a claim to the shipping company. In the event of damage we reserve the right to replace the item or pay for the repair of the item. If a customer wishes to return the item without allowing for repair or replacement then it will fall under the guidelines of our return policy and the customer is responsible for the actual shipping costs for the original and return shipping. We are not responsible for any costs of installation or any supplemental costs due to a delay of the project resulting from damaged or items shipped in error, however once we receive notice of the damage we will arrange a replacement as quickly as possible and we will cover the regular ground shipping costs to correct the problem. Our moulding and other small architectural products are normally shipped via ground. When you receive your shipment, check the contents immediately to make sure that you received the correct number of items and for any signs of damage. Whether there are minor defects or worse damage please take digital photos and call or email us within 3 days of receiving your package. There is a limited time frame for action to be taken for damage and missing items, so please notify us as soon as possible to remedy either situation. In rare cases where heavy damage is inflicted on the box during shipping, the carrier will intercept the delivery and have it returned to us without notifying the recipient. If this has unfortunately occurred to any package, we will ship out a replacement order ASAP. If you requested and have paid for expedited shipping and the shipment is returned undelivered we will contact you before re-shipping your order. We do this because expedited orders are usually time sensitive. Open and inspect your contents as soon as is convenient for you. If there are minor defects or damage to one or two pieces, don't reject the whole shipment. Call us or send an e-mail within 3 days to report the damaged items. Some of the small fountains are quite delicate and should be inspected as soon as you receive them and contact us to report any damage. Our fountain suppliers are very specific in their requirements for claims so please have digital photos of the damaged areas ready to email. Our suppliers use the photos to review the damage and also for shipping claims. For items that are heavy (over 150 lbs. ), large, or hard to manage, we will provide a lift gate equipped truck for delivery. Delivery of freight will be to the most accessible location that the back of the truck can reach. If needed, please be prepared with extra help to handle once it has been unloaded. The driver will not transport the crate further then where it is unloaded from the truck. The driver is also not responsible for un-crating or removing the crating materials of the package. It is recommended that you have a cordless screwdriver with a #2 Phillips head and a claw hammer ready at the arrival of the truck. If there is no indication of damage on the crate at the time of delivery, the driver is not obligated to stay for an inspection. However, if the crate is opened after the driver has left and damaged items are discovered, leave the contents as they are and document the damage with a digital camera. This will assist us in the future for claims and allows us to assess the damage to determine if we will want the item sent back to us. Large fountains are a considerable investment and are shipped with special instructions. When your fountain arrives you should be ready to un-crate it at that moment. A cordless drill with a #2 Phillips head driver and a claw hammer should be ready at the arrival of the truck. Slate and copper fountains must be examined with the driver present to insure there was no damage to the fountain during shipping. If any damage is detected, refuse the shipment, making sure the driver has noted the damage on the BOL. Damage must be reported in 24 hours or the next business day. Marble products must be opened and inspected within 48 hours of receiving. Document any damage with a digital camera and call us to report the damage with in 48 hours or the next business day. WISHIHADTHAT, INC. provides a LIMITED LIFETIME WARRANTY to the original purchaser of our polyurethane products. This LIMITED LIFETIME WARRANTY provides that the polyurethane material will be free from manufacturer defects in material and workmanship under normal and expected use. This warranty does not encompass all of the products sold by Wish I Had That.com and is exclusive to our polyurethane products only. Other products may carry their own manufactures warranty. Call us at 1-800-419-1130 for details. WISHIHADTHAT, INC. provides a LIMITED 5 YEAR WARRANTY to the original purchaser on the FINISH of our polyurethane products. This LIMITED WARRANTY provides that the FINISH on the polyurethane material will be free from finishing defects under normal and expected use for a period of five (5) years from the date of purchase. This warranty does not cover failure of a customer applied finishing system caused by material incompatibility. If the material proves to be defective and has been installed and existed within the bounds of the above requirements, the customer should contact WISHIHADTHAT, INC. in writing or by phone within 30 days of discovering the material defect. WISHIHADTHAT, INC. may require digital images, a sample of the material or a combination of material and images to be sent to WISHIHADTHAT, INC. for evaluation. Upon review of materials and installation methods, WISHIHADTHAT, INC. will determine if replacement, repair or refund is appropriate. WISHIHADTHAT, INC. is not liable for the cost of labor, transportation, or any other expenses incurred in conjunction with the purchase, use and installation of the material. This warranty applies to our polyurethane based materials only. WISHIHADTHAT, INC. provides a LIMITED 5 YEAR WARRANTY to the original purchaser of our Michelangelo series of ceiling medallions. This LIMITED WARRANTY provides that the Michelangelo Medallion will be free from defects under normal and expected use for a period of five (5) years from the date of purchase. This warranty does not encompass all of the products sold by Wish I Had That.com and is exclusive to our Michelangelo Medallions only. Other products may carry their own manufactures warranty. Call us at 1-800-419-1130 for details. Michelangelo Medallions are for decorative use only and cannot support the weight of a light fixture or ceiling fan. Your fixture/fan must be supported by the junction box or other support system separate of the Michelangelo Medallion. The Michelangelo Medallion must be installed in accordance with the supplied instructions. Neglecting to install the medallion in alignment with the instructions can cause serious structural stress on the medallion resulting in premature failure. This warranty does not cover the failure of customer applied finishes or any damage resulting from the application of customer applied finishes. The customer is responsible for ensuring that any additional finish is compatible with the base material. If the Michelangelo Medallion proves to be defective and has been installed and existed within the bounds of the above requirements, the customer should contact WISHIHADTHAT, INC. in writing or by phone within 30 days of discovering the material defect. WISHIHADTHAT, INC. may require digital images, a sample of the material or a combination of material and images to be sent to WISHIHADTHAT, INC. for evaluation. Upon review of materials and installation methods, WISHIHADTHAT, INC. will determine if replacement, repair or refund is appropriate. WISHIHADTHAT, INC. is not liable for the cost of labor, transportation, or any other expenses incurred in conjunction with the purchase, use and installation of the material. This warranty applies to our Michelangelo Medallions only. This policy page may change without notice. This policy was last updated on 10/03/2018.